There are a few different soil testing methods used by labs today, but it is the results of those tests that are most important. Lab results are loaded with technical jargon, often with little explanation as to their meaning or how to use the information recorded. Labs may offer different types of tests or may only offer tests bundled together. Which tests are the most important for your needs may be a difficult choice. These pages will help you understand testing procedures and analysis results. Testing for soil pH and buffer pH and required amendments if needed. The correct pH is based on grass species or plant requirements. The macro nutrients- Nitrogen, Phosphorus, Potassium. Your soil's composition with percentages. What is included varies with labs. Micronutrients are sometimes included, while other labs will offer them with an additional charge. Remember that accurate results begin with the way you collect the soil for your tests. This, and more, is explained in the links at the bottom. Don’t forget that many home and professional soil pH test kits are available with fairly accurate results. How to use the information obtained from home kits is sometimes included. 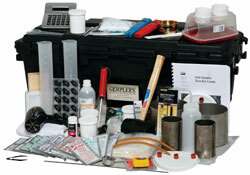 Big pro kits like the Gemplers Test Kit shown in the photo offers 12 different types of tests. This kit tests for soil pH , soil nitrates, soil salinity, soil compaction, soil texture, soil respiration, and more. Manufacturers offer kits with a wide variety of tests. Turf managers, nursery and greenhouse workers, and lawn enthusiasts can purchase these pro meters and kits, ranging from soil compaction test equipment to full soil testing kits. Smaller kits are more affordable and can be purchased at home and garden stores and online. The big soil testing kits are not really practical for the occasional user and are quite expensive. The large kit above is several hundred dollars. They are used by golf course superintendents and commercial turf and nursery operations, farmers, and others. It still remains that for some specialized test procedures or where accuracy is absolute, a testing lab should be contracted. Labs give you an "average" of all nutrients it tests because the soil taken from several spots in the lawn is thoroughly mixed together before testing. However, if you are a plant enthusiasts and have many plants that require different levels of soil pH for maximum growth, investing in a good pro pH meter is a good choice for you. Azalea, dogwood trees, tomatoes, junipers, pines, etc. are acid loving plants. Arborvitae, although in the pine family, prefers neutral to slightly alkaline soil. If your lawn or garden has many plants requiring different soil conditions that you want to keep track of, then home testing is the way to go. A knowledge of soil testing methods excel here. It is impossible to tell what nutrients are in your soil just by looking at it. Some soil conditions may be more obvious, such as the presence of heavy clay, but the percentage is determined at a lab. The soil pH, along with specific nutrients that may be lacking, cannot be determined unless a test is performed. The test results determine what amendments and nutrients should be added or withheld. Whether you use a commercial lab or your own testing equipment, an understanding of soil testing methods is always helpful. Check out the pages below for help in performing basic tests, for understanding the test analysis, soil testing methods, and more. The first step in understanding what is in your soil is to take a soil sample. Click here to find out how to how to collect a soil sample that will deliver the best results. Understanding the soil analysis report can be difficult. Click here for an explanation of results commonly found of most reports. Spreader calibration made easy! Knowing if your spreader is actually putting down the right amount is important for professionals and homeowners alike. This page offers all you need to know about calibrating your broadcast or drop spreader. Nitrogen is the most important element in lawn fertility. However, different types of fertilizers can deliver nitrogen differently. See what sources of nitrogen are available from organic to inorganic, as well as, when and how they are best used.